Photograph of the Nand Bhavan at Dig in Rajasthan, taken by the studio of Priyalall & Company in c.1900. The Nand Bhavan is one of four main pavilions in the 18th-century garden palace of the Jats of Bharatpur at Dig, built by Suraj Mal (ruled 1733-63). The pavilions stand on each side of a square formal garden designed in the Persian-Mughal tradition of the char bagh, divided into four parterres by water channels filled with fountains that run from each of the pavilions to an octagonal pool in the centre. The Nand Bhavan (c.1760) is built of yellow sandstone and lies on the northern edge of the garden. 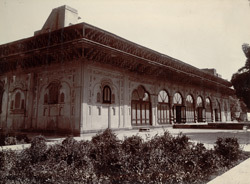 It is a single-storeyed, long, rectangular building raised on a terrace with a central hall. This view of the façade shows an arcade of arches beneath two tiers of deep projecting double eaves. The album of 'Views in the Bharatpur State and Neighbourhod' was presented in 1912 to the India Office by the Festival of Empire, held in 1911 at Crystal Palace in London to mark the coronation of George V. The Maharaja of Bharatpur was among the exhibitors in the Indian Section of the Imperial Exhibition held as part of the Festival.